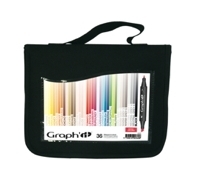 Graph It Marker set containign 36 rich vibrant colours. The colour selection gives a range that will appeal to a wide audience of alcohol marker users. Click the button below to add the Set of 36 in a wallet to your wish list.